We’ve managed to get a few more copies of this best-seller, but when these are gone, we won’t be getting any more! 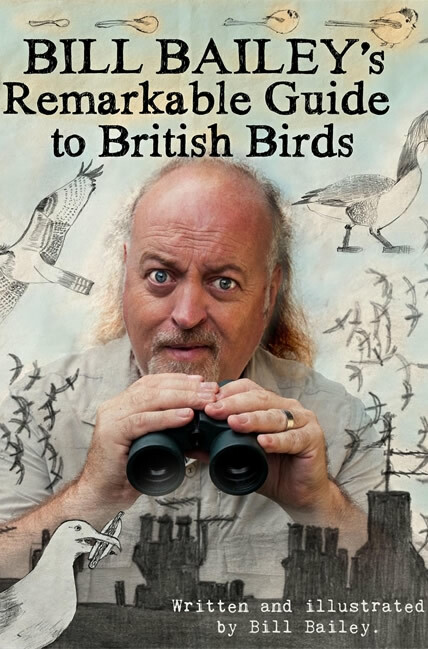 Bill Bailey’s Remarkable Guide to British Birds is all about comedian Bailey’s love of birds. A visual feast – it is packed with illustrations, sketches and notes by Bailey – as well as informative, it is funny and insightful, and positively crackles with energy, knowledge and wit as he takes us on a journey around the British isles, zooming in on those birds that enthuse him the most. Whether it’s what they eat, where they fly to or how they communicate, these birds are always fascinating, and Bailey introduces us to their weird and wonderful ways in a manner that is always entertaining. A beautifully and originally designed hardback, it will delight Bailey’s fans as well as those who like a bit of armchair escapism. The book is lavishly illustrated throughout with drawings and cartoons by Bill Bailey. There are also a number of photographs from the Shutterstock image library.